El Monumental is the name for the ultimate classic in world soccer. Although many wrongly assume that the penultimate game is Barcelona versus Real Madrid in Spain or Manchester United versus Liverpool in England, nothing can ever compare to the final of the Copa Libertadores. It is the final of the best of the best of South American teams and emotions for the game are the highest in the world. Furthermore, for the first time in a century, the two best teams of Argentina, River Plate and Boca Juniors, both from Buenos Aires, are playing that two-legged final this week. Last week the opener ended in a 2-2 draw. Tickets for the return which will be played tonight were selling for as much as $8,000 online. Just to make you aware of the importance, for the final training of Boca Juniors yesterday, 50,000 fans showed up just to see they boys stretch and shoot some passes. River Plate taking on Boca Juniors for the final of the Copa Libertadores is a once in a lifetime game and thus young Renzo really wanted to go. But his parents are poor and when he wanted to see the stadium last time, the family had to save up for a few weeks. Renzo thus set up a stall in his home in Paraná selling the only things of value in his possession, his own toys. 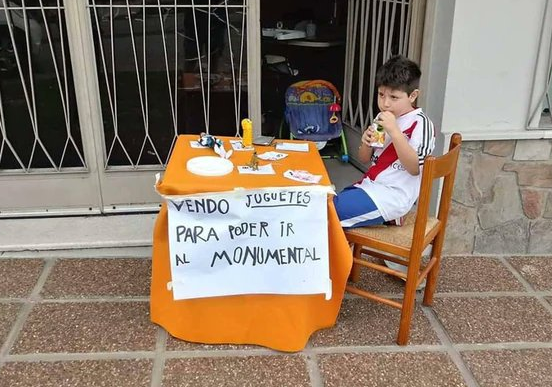 "I'm selling my toys to try and get to El Monumental", was his marketing slogan which went viral after his parents, so touched by their child's initiative, posted the picture to Facebook. Soccer fans around the world were touched and when the president of the Parana River Plate supporters club saw it, he wrote a letter to the Argentinean football federation. Dr. Renzo Gatto, the former President of River Plate ensured that the Argentinean football federation would secure two tickets for Renzo and his mother to travel to Buenos Aires and witness Marcelo Gallardo's River Plate attempt to secure their fourth Libertadores trophy.